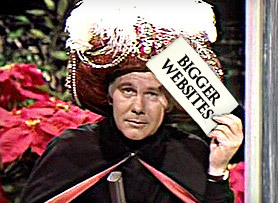 Prediction: Your website will get bigger. Much bigger. I agree with Kevin. If anything, I believe that he’s understating things. In my opinion, the law firm website is going to flourish. In fact, I expect that most law firm websites will grow three or four times larger than they are today. Why? Because attorneys will be creating more and more content. Powerful market forces have converged to make content marketing (the creation of reputation-enhancing articles, blog posts, videos, podcasts) more prevalent than ever. And it only makes sense that all this content is compiled in one central place -- on the firm’s website -- even if it was originally created for publication elsewhere. As a result, I expect that you’ll see an explosion in the size of law firm websites. Navigation challenges – As the volume of content grows, it’s important that the content be organized in a way that makes it easy for users to find what interests them. This is no small task. Many law firm websites will become un-navigable if much more content is added. Oddball content – Currently, the overwhelming majority of website content is text-based. This is changing. You’ll be seeing more videos, podcasts, PowerPoint presentations, and social media content. Unfortunately, most law firm websites can’t gracefully accommodate oddball content. In short, the proliferation of content means that the next generation of law firm website will be bigger and more flexible than its predecessor. How exactly will this manifest itself? We have some ideas. However, I’m curious to hear yours. I thought it was an interesting post and totally agree that the more varied the content – in terms of medium – the more important websites will become. Going straight to the source – in this case the law firm – will not go away anytime soon. I agree Paula and Robert. Saying that social media will make websites less important, is like saying the advent of newspapers will make books less important. They both feed and build off each other. I don’t think social media will supplant websites for any industry, particularly professional services firms. Social media, like many others are supplements, not replacements. Because of the way that law firms are structured and the sheer volume of content they produce, they need platforms that are far more robust than social networks to serve as a repository for all of this information. Plus, the user base for social media platforms still pales in comparison to overall web users and I don’t see that shifting significantly enough for social media to replace traditional website any time soon. I agree with you that the way forward will be an increase in scale and that there will be a greater imperative for law firm leaders to be more thoughtful and externally focused about the way they approach usability and information architecture for future iterations of their sites. Looking “pretty” and making partners happy won’t be enough and the ability to render properly on mobile devices will be a bigger part of conversations around future website overhauls. Robert, I couldn’t agree more. Agility is the key in developing user-centric web platforms for firms that want to engage online. From our experience though, building agile platforms that allow multi-dimensional engagement isn’t the issue, but rather what is, is encouraging firms to do so, particularly when the ROI isn’t always apparent in terms of actual client conversion. That said, for firms really wanting to be client-centric online, the technology, particularly its diversity and ease of integration often at low cost, things couldn’t get much better. Attorney websites are already bigger. Some several thousand pages. What happens when everyone abandons Facebook for the next hot social media property. Everyone has to start over? I wonder if we can dig up an article about myspace saying how websites will not be needed due to sites such as myspace. Interesting article. I agree with you that websites will not be extinct. In fact, from a legal standpoint, I don’t forsee law firms permitting all of their content to be surrendered to social media platforms and owners. These social media companies sell their businesses, evolve into something else etc. You want to maintain your content on your platform for the reasons cited and more. As to your questions posed, I don’t know that there is much to ponder about. Popular news websites, blogs etc. already deal with these issues. It just means law firms will have to spend more money on dedicated servers that accommodate all of their content. I believe websites are the cornerstone of any marketing effort. Research shows they’re here to stay and will only get better and bigger. When Hubspot did an analysis of online activity of 33 top keywords related to law, search engines (looking for websites) amounted to half of all the activity; blogs accounted for 25% and all of social media (Facebook, LinkedIn, YouTube & Twitter combined) accounted for 25%. See http://bit.ly/oYGAk3 and refer to page 4. I agree with Kevin because i believe the law firm website will going to flourish. Thank you for sharing the information.